It is really hard to turn away from sweets when there is beautiful chocolate like this in the world. 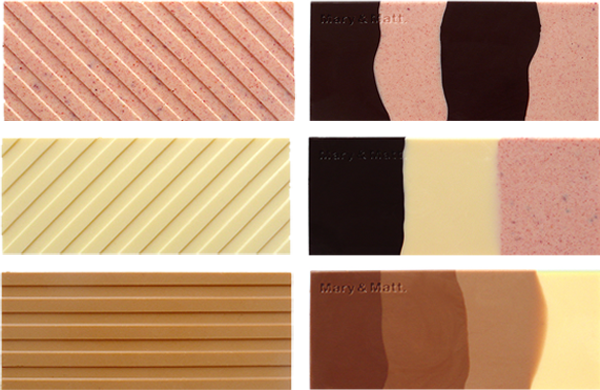 See more beautiful designer chocolate from Chocolate Editions by Mary & Matt. I'm thinking these would be great stocking stuffers or gifts to have on hand. those chocolates are absolutely beautiful. they would most definitely be wonderful gifts to have on hand! Cute idea for stocking stuffers. I want! who knew chocolate could be so designery? amazing! gorgeous! love how sleek they are. Those are really cool! My mom would love them. Thanks for sharing! Mega yum!!! Almost to pretty to eat! This looks so delicious! I am in love! Soooo beautiful and delicious (I'm sure)... Mmmmm. Dang - just when you thought chocolate couldn't get any better! It's always really wonderful when sweets are combined with great aesthetic design. I love the diagonal lines on the bars.